Happy Hues-day, friends! And welcome to "favorite paint color" day on the blog. Each week a different paint color is featured. Today's color is Benjamin Moore Stratton Blue, a beautiful turquoise that looks great on walls, cabinets, and furniture! 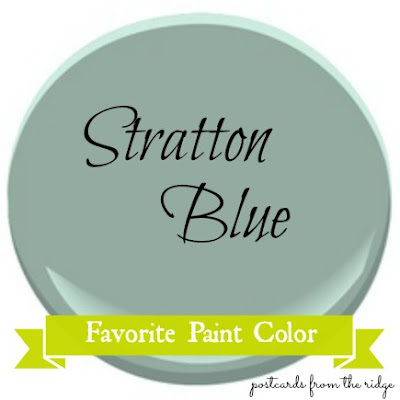 Stratton Blue is a color that would go great with cream, orange, cranberry, or yellow-greens. It has some gray undertones, so strong, clear, bright colors wouldn't look as good with it as somewhat muted colors would. This office is calm and peaceful, but not boring. The Stratton Blue looks nice with the linen covered chairs. And the sisal rug adds a warm touch of texture to the space. The same room, before paint. What a difference a coat of paint makes to the space. Can you believe this is the same room? For a tutorial on how to paint paneling, go here. This kitchen is gorgeous with the Stratton Blue and yellow-green cabinets. The colors complement the wood tones beautifully and add such a lively personality to the space. Although this space is a little formal for my taste, it is truly stunning. The Stratton Blue walls are the perfect backdrop for the rich wood and the gold fabrics in the room. There's not anything that I don't like about this office space...except that it isn't in my house! The desk, rug, chair, light, and even the wall color are perfect. What's your opinion of this week's color? Where would you use it in your home or office? I love that color! I've never paid any attention to Stratton Blue before but will have to add it to my list to check out. Thanks for the inspiration! It's on the same color strip as Wythe Blue, but it's one shade darker. It's a really pretty shade!